.yr alba ceòl: Sacha Baron Cohen = hero. Short article about Sacha Baron Cohen's wee stunt at the Oscars. 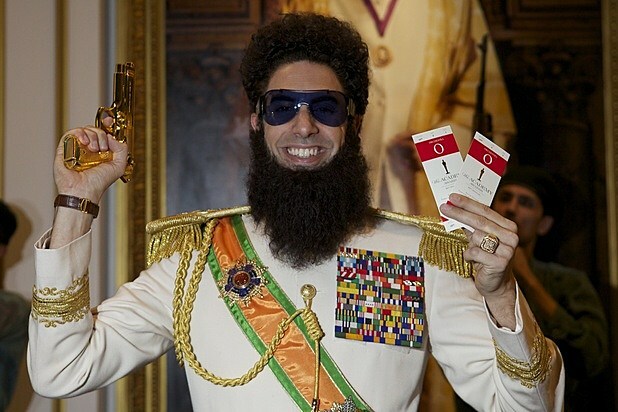 Sacha Baron Cohen was declared persona non grata by the Academy, for his intentions to arrive in character as his latest creation Admiral General Aladeen, star of his upcoming film The Dictator. But the ban was short lived (can you hear the PR cogs turning?) and Cohen graced the red carpet, clutching the ‘ashes’ of late dictator Kim-Jong-Il, which he subsequently chose to pour on TV presenter Ryan Seacrest. If this is the kind of controversy the Oscars was looking to avoid, Baron Cohen was never likely to oblige. In 2006, he crashed the Toronto Film Festival as Borat - another of his satirical guises - riding onto the red carpet in a carriage harnessed by six peasant women. The film was boycotted by the Kazakhstani government for 'defaming their nation in the eyes of the world'. In 2008, Baron Cohen prodded the bee’s nest at the MTV VMA’s, by staging a ‘fly-by gone wrong’ in which he landed semi-clothed into a disgruntled Eminem’s lap. Pushing the boundaries of social tolerance has become the raison d’être of much of Baron Cohen’s work, but does it leave a bad taste in one’s mouth? Or are his debacles becoming the reason to tune into jaded television ceremonies?